Growing up in small-town Ohio in the 1980s, Sean Duncan dabbled in video and board games like many of his friends. Classic arcade games like Galaga and role-playing games like Dungeons & Dragons were some of his favorites. But as Duncan grew older and his spare time became more limited, his interests – as you’d expect – changed. By the time Duncan was an instructor at Miami University in Oxford, Ohio in the early 2000s, he hadn’t played games in several years. As a young professional in his early 30s, he had lost touch with the hobby. But all that changed after a few of Duncan’s students urged him to give one of the latest gaming systems a try. Duncan bought a Nintendo GameCube, and the rest was history. With the idea of delving deeper into games and gaming culture, Duncan went on to get his Ph.D. in educational communication and technology from the University of Wisconsin. Today, as an assistant professor of media studies at the University of Virginia, his scholarly work revolves around the play and cultures of digital and, increasingly, non-digital games. Duncan’s focus is to help students understand the ways that games serve as platforms for social interaction and as playful systems that shape communities. Q. What kind of reaction do you get when you tell people what you do? A. Well, one question people always ask first is, “Is it OK that my kid is playing so much Minecraft?” Or, increasingly: “What about Fortnite?” There’s still this common sort of unease about games in some people, which I think is really borne out of lack of firsthand experience with these media. There’s a generational shift happening and our public discourse about games is rapidly changing. Sure, we’re still trying to figure out what is appropriate, what’s too much, but also, digital games have been with us for almost two generations now. They’re not going anywhere and so I think our approaches to engaging with them just have to change. Q. So, what do you tell those parents when they express that “unease”? A. First, I ask them what their kids play, but I also ask them if they play with their kids. I think that’s a key part of it. We honestly don’t play enough different kinds of games as adults or know how to point kids toward new games that can enrich their lives. The kinds of things people do in games varies as widely as the number of games that there are, and I suspect much of the public unease with games is frankly due to ignorance of the wide variety of things games have become and can be. If a child is spending all their time online playing one military-themed, first-person shooter, then sure I would probably have some concerns about that, but mainly because it’s like eating nothing but chocolate cake for dinner. These are but one type of game, and involve buying into one kind of consumer approach to games. In my courses and in my work, I try to shine a light on the many different kinds of creative exploration of games out there – personal experiences which let them see through someone else’s eyes, or games that help one to understand something in the world in a new way. A. Lately, I’ve tried to help students understand how games model things in the world. Many games have stories that emerge out of play, and they’re also things for us to discuss. They help us to critique the world and provoke us to action. Back in graduate school, I was part of a group that focused on what are known as “serious games” and games for learning. I still use these in my courses, as they help students understand how games express complicated and important meanings. There’s an older game by Paolo Pedercini called the McDonald’s Video Game, which puts you in position of managing not just a McDonald’s, but also the corporate office, the supply chain and farms supporting it. You have to decide whether or not to tear down forests in order to make more grassland for cows, deal with whether or not you treat your workers fairly, choose to pump cows full of antibiotics, and so on. It shows the systems of the fast food industry and how it’s rigged to damage the environment and to exploit labor. It’s a piece of political activism, in the form of a playable and oddly fun game. It’s a way of letting players experience systems in the world through play, and I encourage my students to start to make games that try to do similar things in my classes. Q. Can you give an example of the kinds of games students make in your classes? A. For the most part, my students make paper prototypes of games rather than digital games, because they don’t have much experience with programming. But what seems like a limitation is actually wonderful for opening them up to lots of different themes and ideas they might not have been able to implement in a video game. Designing analog games – role-playing games, card games, board games – is so much more approachable to many students than video games, which have compelling subcultures but also alienate many. 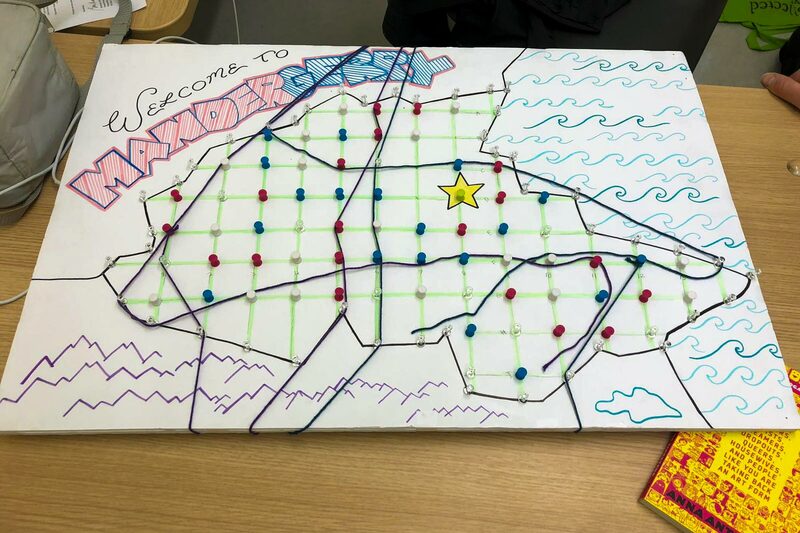 My students’ games have run the gamut from a game about the Cambridge Analytica Facebook privacy scandal to a game about racial profiling to, this semester, a game that tried to tackle gerrymandering [pointing to a model game board]. One of the things this group of students did was to try and come up with a way for players to act out the process of gerrymandering, moving pieces of yarn around a peg board to try to change the ratios of voters in a set of fictional voting districts. Students learned how difficult it is to make a game, but also how their design choices shape and guide the experience of others – how to convey a message while also giving players choices. Most of these games are rough drafts at best, which is totally fine, as I’m most interested in helping students get a taste of how designing a game pushes you to try to understand the thing you’re simulating. Next semester, I’m teaching a new course entirely about storytelling games where students will be wrestling with how to convey stories and messages through these media, ranging from tabletop role-playing games to digital interactive fiction to escape rooms. Q. For those who may not know, what is an “escape room”? A. Escape rooms are internationally quite huge and are growing in the United States. I think Charlottesville has at least three of them right now. In an escape room, you and your friends choose to be locked in a room, which is usually decked out in some kind of theme (like deducing Jack the Ripper’s identity or finding a lost spy dossier). The room itself is then a puzzle or set of linked puzzles that you have to solve to try and figure out how to unlock yourself from the room within one hour. I want to teach about these because they’re one of the most popular game-like things out there, but few people consider them games in the same way as [video games] Red Dead Redemption or an Overwatch. My notion of what a game is is very expansive – and that’s intentional, because I want students to look at all different types of ways we play and engage with games out in the world. And escape room businesses are playing around with story and theme in all these interesting ways nowadays. Q. So, what games are and what we think about games are changing? We should be looking beyond phones, Xboxes and Playstations? A. Certainly, yeah. The world of video games is an important one, and it’s definitely the most economically significant, but the creative booms that board games and story games and card games and escape rooms have had in the past few years are hard to ignore. I don’t mean to say that staring at a gaming screen is a terrible or scary thing; it’s not. But personally, I find myself drawn to studying and teaching about games that connect people physically at a table, that are played in public spaces, that people of all ages can pull apart and remake together. Lately, I like to watch my son [age 5] mess around with board games and pick things apart in them. He’s been drawing his own board games on cardboard boxes, inventing games out of pieces of other games and spare Pokémon cards, and that’s exciting to watch. We all know on some level that games aren’t just things to buy and consume, they’re things for us to tear apart and rebuild to express ourselves with and make experiences for others. If I can bring back a similar childlike wonder about games to my students while also showing them that these media have communicative power for adults, then I’ll be happy. Games should be for everyone, and we all have the power to change them.